1 Bid 25,000mps or more on any item in the Auctions. 2 Purchase a Rarity 5 or higher item from the Weapons Shop. 3 Find the Bolimo in the Open Graves. 4 Have 10 or more Trading Cards in your deck and view your deck. 5 Complete 25 or more Elger Quests. 6 Gain a Pet stat at the Clock Tower. 7 Complete level 5 or higher at the Trotter's Movies Mission. 8 Collect 20 or more Trading Cards in your Battle Deck. 9 Dig up any White Bone from the Grave Robbing game. 10 Complete 50 or more Elger Quests. 11 Own any Zombie colored pet. 12 Own a Limited Edition Daisy pet. 13 Collect 30 or more Trading Cards in your Battle Deck. 14 Win an Undying Tombola DVD at the Undying Tombola game. 15 Complete 100 or more Elger Quests. 16 Own any Nefarious colored pet. 17 Offer 100,000MP or more on any item currently in the Auctions. 18 Collect 40 or more Trading Cards in your Battle Deck. 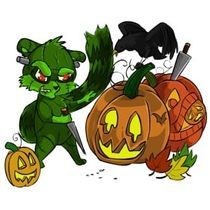 19 Own any Halloween colored pet. 20 Complete level 10 or higher at the Trotter's Movies Mission. 21 Complete 150 or more Elger Quests. 22 Own any Ghost colored pet. 23 Collect 50 or more Trading Cards in your Battle Deck. 24 Resurrect any Undying Minipet. 25 Complete 250 or more Elger Quests. 26 Offer 250,000MP or more on any item currently in the Auctions. 27 Complete level 15 or higher at the Trotter's Movies Mission. 28 Complete 350 or more Elger Quests. 29 Offer 500,000MP or more on any item currently in the Auctions. 30 Complete level 20 or higher at the Trotter's Movies Mission. 31 Win a Bonus Prize at the Undead Billiards Flash Game. 32 Win 500MP at the Spooks Busters game. 33 Resurrect any Undying Minipet. 34 Complete 450 or more Elger Quests. 35 Complete level 25 or higher of Trotters Mission. 36 Win 1,000 mps from Spook Busters game. 37 Own a pet with 100 Health points and view pet stats page. 38 Have 75 or more Trading Cards in your Deck. 39 Offer 100,000 mps on a Pet Auction. 40 Complete 550 or more Elger Quests. 42 Complete the Trotters Movie Mission. 44 Own a pet that has 200 health stats for the Vampire. 45 Win any wardrobe prize from the Undying Fairy. 46 Collect 100 or more Trading Cards in your Battle Deck. 47 Complete 650 or more Elger Quests. 48 Win 10,000MP at the Spooks Busters game. 49 Own a pet that has 300 health stats for the Vampire. 50 Complete the Trotter's Movies Mission.